Ever alert for a good marketing opportunity, The Sixteen has taken to releasing on its own Coro label the programme currently being taken on tour ‑ the idea, of course, being that a goodly number of physical sales can be made to audience members departing in that state of euphoria which usually follows a Sixteen performance, and keen to take away some tangible memory of the performance to re‑live in the comfort of their own home. Those programmes, too, have latched on to the perceived taste of today's audience for musical variety, and have encompassed a huge array of musical styles and periods thematically connected by a literary phrase. The Sixteen today is a choir as notable for its range of repertoire as for its performing perfection. That has not always been the case. The Sixteen first attracted the kind of ecstatic critical acclaim that now follows it wherever it goes back in 1979 when it gave its first concert. In those days it specialized in the music of English Tudor composers, and, as such, was ploughing a relatively lonely furrow. Not any more. Jumping on the bandwagon, choirs and ensembles have sprung up in profusion specializing in Tudor music and presenting it at least as well and certainly as imaginatively as did The Sixteen. What was, three and a half decades ago, something rare and wonderful, has become almost commonplace. 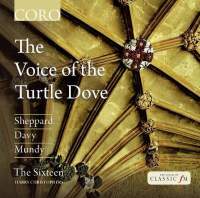 So it might seem a strangely retrospective step for The Sixteen now to release a disc devoted to Tudor music. 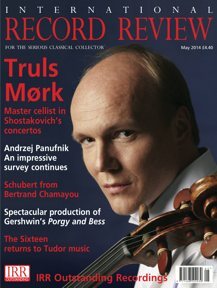 As Harry Christophers points out in his introductory note in the booklet, in this programme The Sixteen is actually returning to its grass roots ‑ there are pieces here which the choir has not performed since its very first public concert in May 1979 and while it, its repertoire and, indeed, audience perceptions have moved on significantly in the intervening decades, this ravishing disc proves it is still very much a choir which has this music in its blood and which can perform it with sublime mastery, knocking into the shade most of its latter‑day imitators. Tuning, tone and breath control are near perfect, diction, ensemble and balance are flawless and dynamic shading, phrase shaping and tempos are impeccable. Relying on authoritative editions from the choir's own Sally Dunkley (who has also contributed a splendid booklet note) and guided by the remarkably astute and perceptive Christophers, these performances have about them an aura of musical supremacy, which, coupled with the choir's technical magnificence and the recording's sumptuous sound, makes this an outstanding disc, even by the phenomenally high standards The Sixteen has long since made its own. And what of the music. The disc's title is drawn, of course, from the Biblical Song of Songs which is here set by William Mundy in his monumental Vox Patris caelestis. Very much the climax of the programme, it is a work full of glorious and vivid musical imagery, magnificently underlined by some breathtakingly superb choral singing. Mundy's other contribution to the programme is the rather more intimate and straightforward setting of verses from Psalm 119, Adolescentulus sum ego. very different works; the large‑scale 0 Domine caeli terraeque creator, composed, it would seem, in a single day, and the intriguing Ali, mine heart, remember thee well, a devotional song with the verses exquisitely sung here by three voices, Kirsty Hopkins, Jeremy Budd and Eamorm Dougan.